With all the above being said, I am pleased to say that Eclipse is both entertaining and amusing, even if you are not a die-hard fan, of which, I am not. The advantage I do have in reviewing these films is that I clearly remember what it’s like to be a doey-eyed teen girl. Twilight filmmaker’s are well aware of their target audience and no holds are barred in this one. 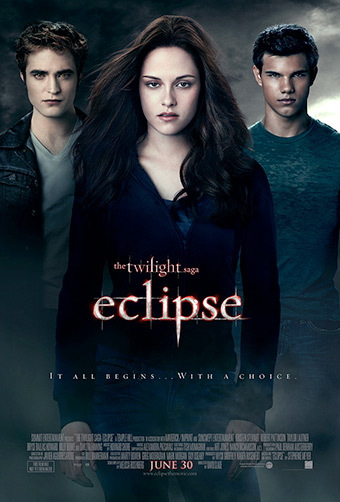 Overall, Eclipse has a heightened romanticized look and feel compared to its predecessors’. The action sequences are also taken to another level. The actors, Kristen Stewart (Bella), Robert Pattinson (Edward) and Taylor Lautner (Jacob) have enhanced their roles and give credible performances. Recently, Stewart and Pattinson have appeared in other films (The Runaways and Remember Me). Both actors gave very different renderings than their Twilight characters. Stewart is developing as a notable actor and Pattinson is not far behind. Their roles in the Twilight films are melodramatic as with the rest of the cast. That’s what makes the films endearing and comical in my view. The scripts are filled with over-the-top drama and these characters are expected to act and react with extreme emotions. The story centers on Bella’s dilemma of being in love with a vampire, her choice of longing to become a vampire; (thus allowing her to live forever with Edward) and lastly coming to terms with her feelings for her friend the wolf-boy, Jacob. Love triangles are an interesting scenario in and of themselves but when you write them for teens the range of emotions explodes. What teen wouldn’t want one lovesick boy or girl longing after them? When you add another to the mix, the emotions of jealously, confusion and competition muddy the waters just enough to make the viewing fascinating. A fantastical dramatic story in the first place becomes heightened with the triangle addition. Clearly, that was the motive behind Eclipse. David Slade is the new director at the helm and he goes for really big onscreen headshots, some that even encompass over three-fourths of the screen. Most of the scenes between Bella, Edward and Jacob are all very close. The technique was over-used in my opinion. Once or twice? Okay. But throughout the film? Too much. What I did like was the character development and all of the new characters that were added. The lines between the Cullen family particularly Kellan Lutz, Ashley Green and the rest were divided up a bit more. Their back-stories were told in flashbacks, which were really cool! The newborn vampire villains were developed and given lots of screen time. The action scenes were fine, not over-kill. Although, I didn’t understand why those wolves (wolf-boys) look so big next to Bella. The wolves are massive, much larger than any wolf on this planet, I’m talking huge. (Maybe, that’s explained in the next film). The bottom-line-Eclipse is a film for a target audience and this one hits the bullseye.